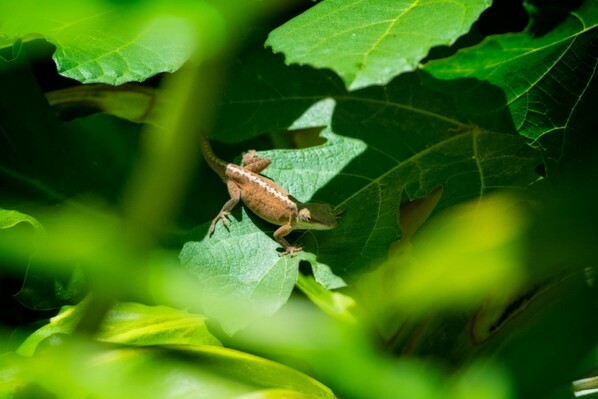 The Anoles are Back - the notWildlife Blog - A collection of high quality backyard wildlife photos. It has been a couple months since I have last posted and equally long that I had last seen any sign of the anoles which once were so easily spotted. This all changed yesterday as I spotted an anole hunting for flies or other small insects in my backyard fig tree. I could not say exactly what he was hunting as he is lightning fast and was moving from leaf to leaf, stopping only to chew and swallow. The fig leaves were too abundant for me to get a better shot, but it was exciting to see that they have not completely abandoned my backyard.